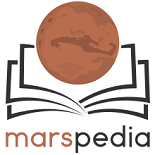 Mars has a mass of 6,419 · 1023 kg. Compared with Earth this is only a little bit more than a tenth. This results in a lower Gravity. The gravitational acceleration is only 3,71 m/s². The resulting weight of any body on the surface of Mars is only a bit more than a third, compared with the same body on Earth. Dust storms on Mars reach high altitude. Scientists found the cause in the low gravity, allowing the sand grains to bounce much higher. The low gravity allows the formation of the highest montains in the solar system, e.g. Olympus Mons. The development of human embryos might be different. Also, the long term consequences for the health of human beings is unclear. Some kind of physical exercise can be helpful. The pressure on bearings is lower, causing less friction and abrasion. A space elevator is easier to build. What is known about the growth of plants under low gravity? This page was last edited on 17 December 2018, at 16:28.